PSALMS 150:1 KJV "Praise ye the LORD. Praise God in his sanctuary: praise him in the firmament of his power." 1Praise ye the LORD. Praise God in his sanctuary: praise him in the firmament of his power. 2Praise him for his mighty acts: praise him according to his excellent greatness. 3Praise him with the sound of the trumpet: praise him with the psaltery and harp. 4Praise him with the timbrel and dance: praise him with stringed instruments and organs. Praise ye the Lord. 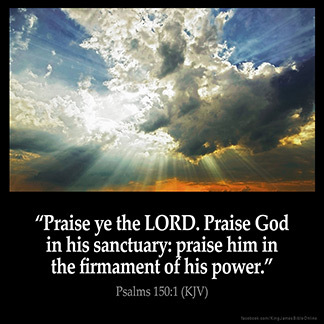 Praise God in his Sanctuarie: Praise him in the firmament of his power. Hallelujah! Praise God in his sanctuary; praise him in the firmament of his power. Hallelujah. Praise God in His sanctuary; praise Him in the firmament of His power. 150:1 Sanctuary - In his temple. The firmament - In heaven: there let the blessed angels praise him.